This entry was posted in Maria B on March 30, 2017 by admin. This entry was posted in Maria B on October 4, 2016 by admin. This entry was posted in Maria B on September 22, 2016 by admin. This entry was posted in Maria B on June 30, 2016 by admin. This entry was posted in Maria B on May 12, 2016 by admin. Success doesn’t required only hard work but luck, passion and lots of pain however the real struggle is to maintain the success after achieving it. I have witnessed many people clinching towards success but they failed to swallow it. The obvious reason is the change in attitude, one of the most important step is to monitor your level of attitude and its impact on your work and people around you. People in your life require your time, so make choices about people who matter to you and value them specially those who have contributed towards your success. Hence to remain successful you should reflect positive attitude towards the society and keep interacting with people who are important to you. So it was 4th Hum Awards and she finally received her best actress award, it was indeed the hard earned victory for her. Yes I am talking about Maya Ali the bubbly character of our industry. Beginning her acting career from a short role in“Durr-e-Shahwar” in 2012 and receiving the best actress award in 2016, within just four years she managed to prove her critics wrong. Well if I talk about our drama industry the entrance of new actor and actress is 1:4 where one actor steps in four actresses steps against him. 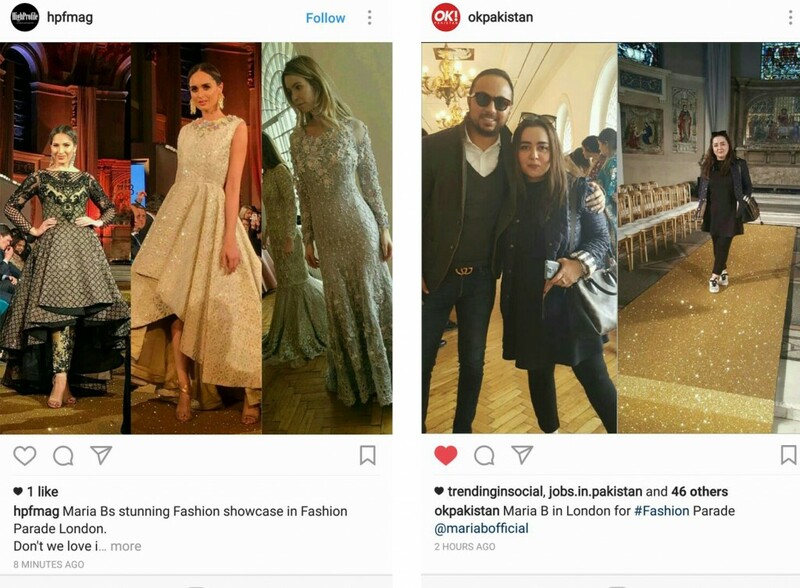 This indicates that being an actress it is hard to sustain the rule of industry but what makes Maya Ali really successful in the industry? 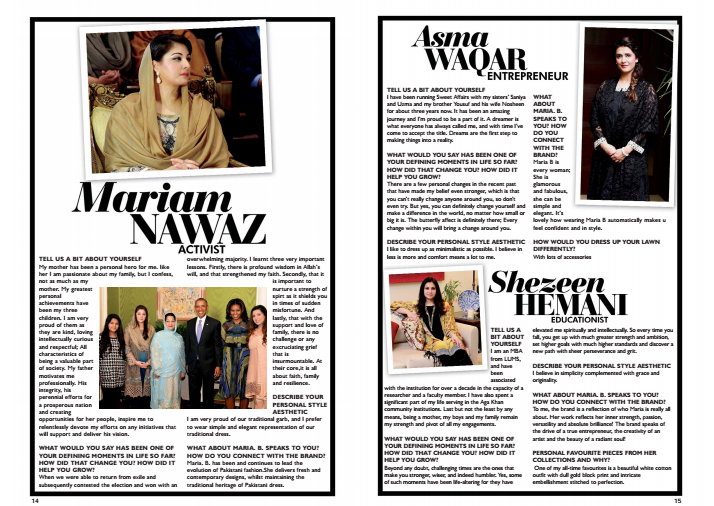 For this I am going shed a light on her career and her struggle and passion. 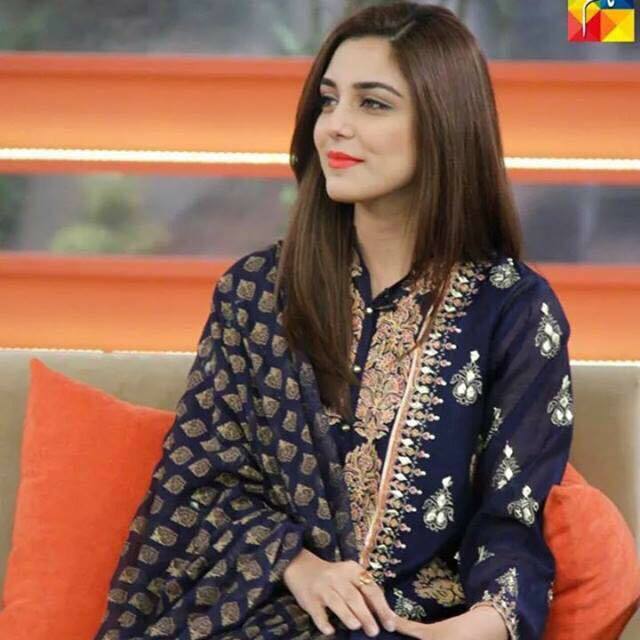 I first saw Maya Ali on Dunya T.V as a co-host against comedian Shakeel Siddiqui in a program called “Hari Mirchein”. She then worked with different T.V Channels as a host and V.J, her popular show was “Har Pakistani Mein Chupha Hai Ek Hero” and “Ramp ki Rani kon”. Many of you might be unaware but Maya is not only a great actress and model but a skilled reporter and talented V.J. Without any doubt her ultimate goal was to become the best actress of Industry, she got the breakthrough in Industry with a brief role in drama serial “Durr-e-Shahwar” aired on Hum-TV in 2012. 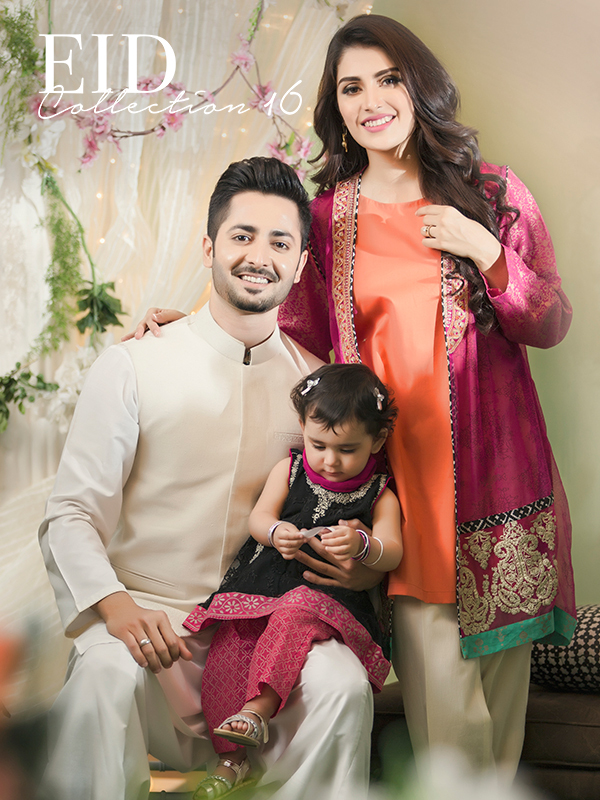 In her very next drama she got the lead role in drama “Aik Nayee Cindrella” aired on Geo-TV in 2012 in which she received gratitude by audience for her debut performance thereby making this drama as signature drama of her. Then dramas like “Aunn Zara” and “Ranjish Hi Sahi”helped her to perform difficult roles with ease. The battle to become best actress was never easy for her, she received immense criticism in her initial projects which includes drama like “Khoya Khoya Chand” and “Meri Zindagi hai tu”. She was tagged with the name of tom boy in most of her preliminary projects because of the fact she did the roles of outspoken and stubborn girl. Bravely she took this criticism in a constructive way and responded to her critics by performing splendidly in drama serial “Shanakht” aired in 2014. She was nominated as a best actress for drama serial “Shanakht” in 3rd Awards. Her continuous improvements and dedication provided her opportunity to perform in mega projects which was indeed her golden chance to prove what she is capable of. Sadly it is a fact that some artists do lots of hard work yet they failed to achieve a level of recognition they deserve just because they are unlucky to get good projects. “Mera naam Yousuf hai” and “Diyar-e-Dil” were undoubtedly mega projects and Maya Ali was phenomenal in both of them. Her acting was surely above par and there were hardly loopholes in her acting. 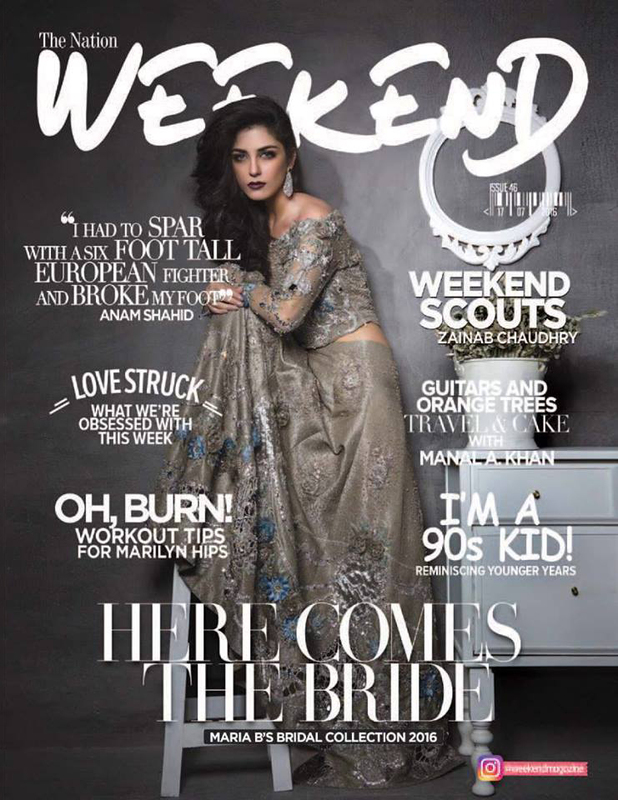 2015 surely belonged to Maya Ali. Finally in 2016 her dream comes true, as she bags the best actress award in 4th Hum Awards for her performance in “Diyar-e-dil”. 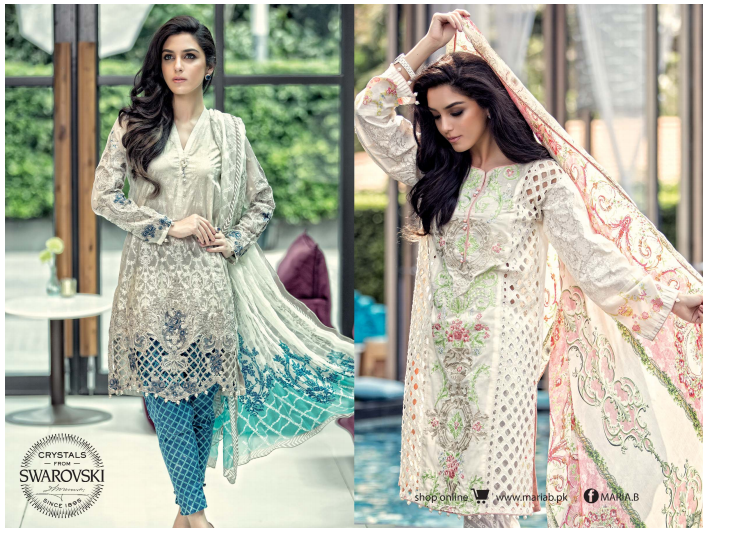 Maya Ali is now the household name of Industry and currently ruling the drama industry after her role in “Diyar-e-Dil” and currently “Mann Mayal”. 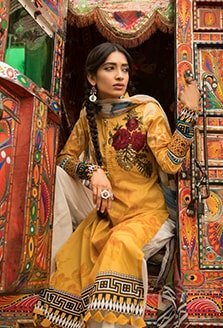 She is now at peak of her career, her success cannot only be defined by dramas only you will find her in many commercials as well that includes Mobilink Jazz, Milkpak, Lipton tea, Lemon Max etc. 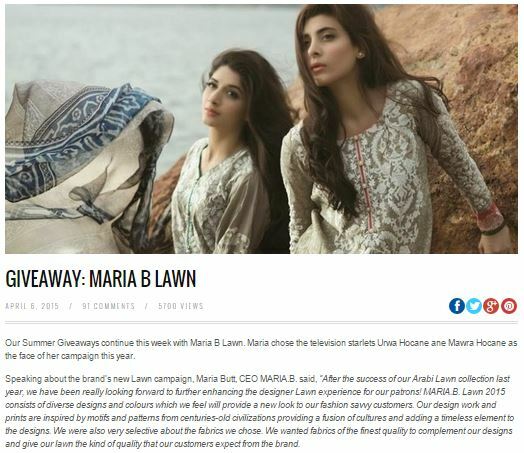 Not only that, she is currently the brand ambassador of popular Maria B’s collection. There is a saying in Urdu “Aatey hi Chah jaana” this was not the case with Maya. She did not only struggled long way to get the breakthrough in industry but also struggled afterwards. 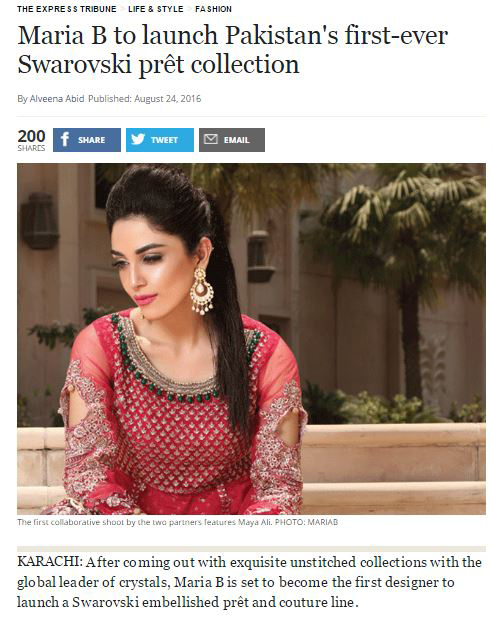 I have always believed in her, she got the potential to become superlative. What really counts in her success is her self-effacing personality and value she give to her loved ones. 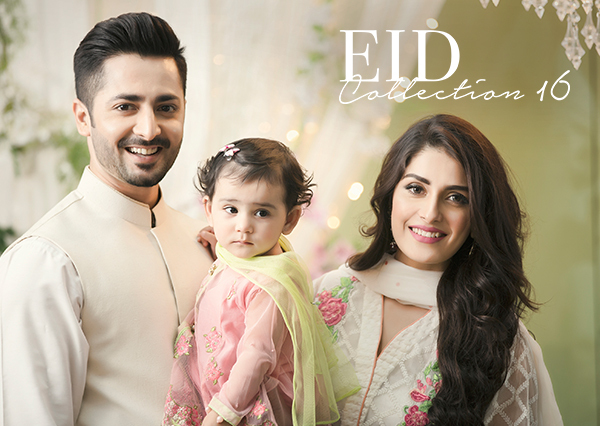 Maya Ali is a very down to earth in real life, she meets and greets with her fans very politely. Life seems to reward us most when we approach the world with positive attitude. I wish Maya all the best of luck for her future. This is the first ladder of success, I hope she will bag more Awards in near future not only in dramas but in films as well. This entry was posted in Maria B on March 27, 2016 by admin. 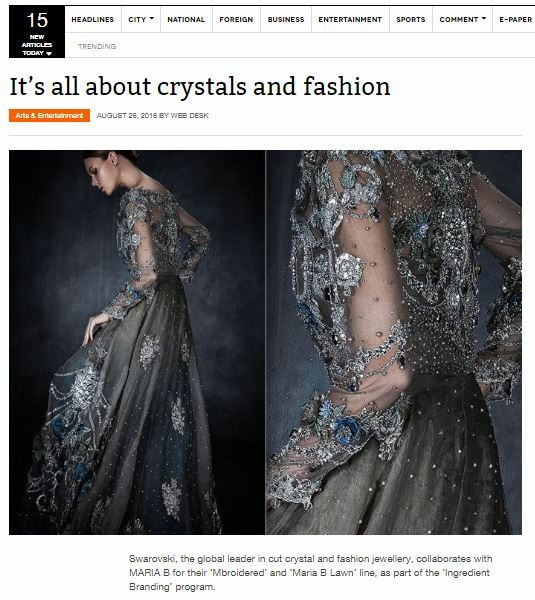 This entry was posted in Maria B on April 6, 2015 by admin. 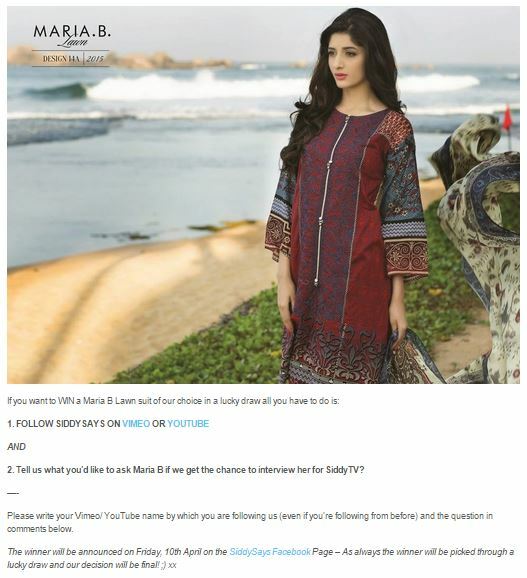 The leading Pakistani fashion, entertainment and lifestyle blog published a giveaway competition featuring MARIA.B. Lawn 2015. 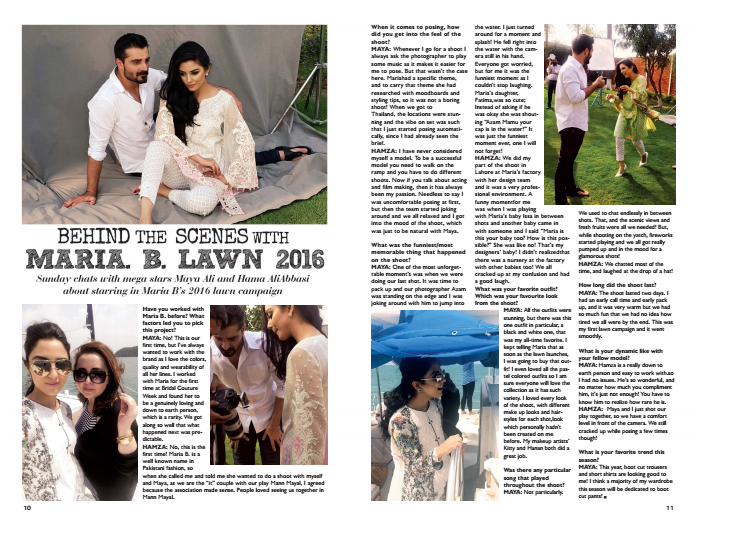 The post featured images from the Lawn collection’s photo-shoot in Sri Lanka.